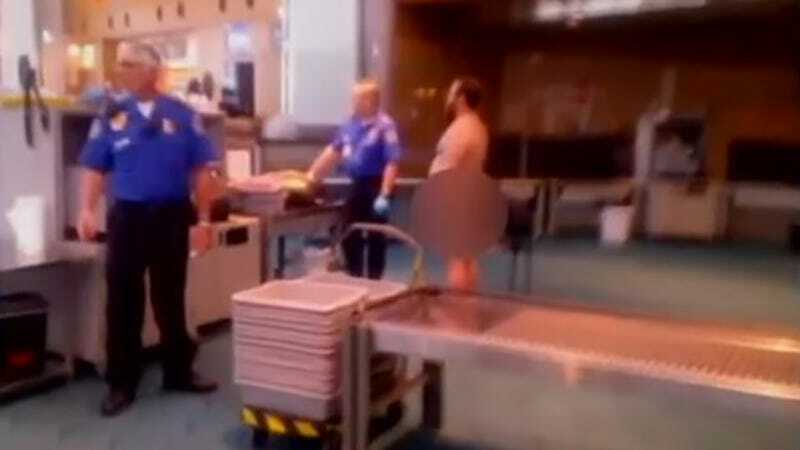 The Ninth US Circuit Court of Appeals has determined that a man who got buck naked to protest an invasive search by the TSA was not within his rights. The good news is that the court went on to define how it could have been protected protest speech, so now you have a guide. The defendant, John Brennan, was arrested at Portland International Airport (PDX) in 2012 for indecent exposure. A TSA agent patted Brennan down while he was going through security and discovered traces of nitrates that could be used while making a bomb. At the time, the TSA was still using its “naked full-body scanners” which showed a fairly detailed image of any traveler who had been singled out for screening. When it became clear that Brennan was going to have to undergo that kind of evaluation, he decided to just take off all his clothes in full view of the public. Many of those witnesses did what anyone else would do and pulled out their phones to broadcast this naked man to the internet. Brennan’s core contention is that stripping naked in the middle of a TSA checkpoint is expressive conduct protected by the First Amendment. But Brennan fails to carry his burden of showing that a viewer would have understood his stripping naked to be communicative. See Clark v. Cmty. for Creative NonViolence, 468 U.S. 288, 293 n.5 (1984); Hilton v. Hallmark Cards, 599 F.3d 894, 904 (9th Cir. 2010). Therefore, his conduct is not protected by the First Amendment. Brennan’s counsel also argued that the defendant wasn’t guilty of “interference with screening personnel,” because he was simply standing there naked. Their defense was to insist any interference was simply due to an overreaction by the TSA. Citing several instances of case law, the Ninth Circuit rejected that defense. Brennan will have to pay a $500 fine. By providing a clear reasoning for their decision, the court has also given everyone a nice set of guidelines for their own naked protests. Above all, it’s important to make sure everyone knows why you’re naked. Obviously, writing on your body is the best strategy. But don’t be like the “Soy Bomb Guy,” no one understood what that meant. Be like Aaron Tobey, who also stripped down in front of the TSA and was charged with disorderly conduct. Tobey had the fourth amendment written on his chest and the charges were eventually dropped.